Glashütte Original is a fine watchmaker that has been in business for over 170 years. The luxury watch brand is introducing their new Glashutte Senator Chronometer watch in time for the upcoming 2016 Baselworld show in Switzerland. The proven accuracy of their watch line has been a consistent feature through the the years of their existence. For example a Norwegian polar explorer named Roald Amundsen purchased an Assmann observation watch way back in 1910. A year later, he proudly became the first person to reach the South Pole. The Glashutte Senator Chronometer has been a very successful watch line. The newest version continues the tradition with a luxury watch, offering certified precision and comes in a distinctive, dark blue version. Glashutte watches have a timeless elegance that make the German watchmaker a respected name in the watch industry. Chronometer watches exemplify precise timekeeping and these watch types have been used as a standard for shipboard navigation. A watch needs to receive approval from and authorized testing institute to be able to use the word “chronometer”. It ensures the watch offers the extreme rate precision its customer have come to expect. Glashütte Original ensures that all of its movements are tested internally versus the strict criteria that the official testing labs require. 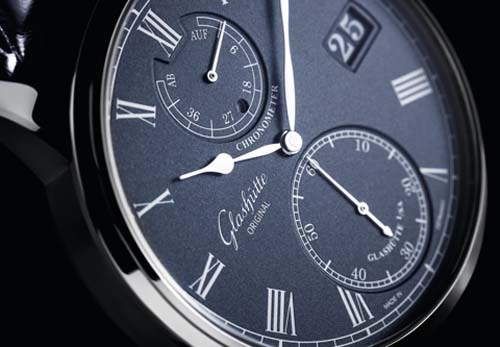 For collectors of Glashutte watches, you know that the color blue is an integral part of its luxury watch line. For the last two decades, we have seen their watches with various shades of the color blue. The vibrant colors add an elegant and modern look. The deep blue dial of the new Glashutte Senator Chronometer watch quickly draws our attention. The watch dial has a dark tone to help emphasize the lacquered and finely grained surface. It’s simply stunning. All elements of the beautiful watch dial have been carefully designed and fitted. You’ll notice the high quality workmanship in the indexes and numerals and railroad chapter ring. Both are finely engraved and have been beautifully galvanized in silver. The 2016 version of the Glashutte Senator Chronometer watch comes in a white gold case that was newly designed. The slim bezel is a known characteristic of the Senator line of watches. The slim bezel allows the gorgeous watch dial to be brilliantly displayed. The Senator Chronometer features the iconic, colour-matched Glashütte Original Panorama Date located at the 3 o’clock position, There is also separate day-night display found in a round opening above the watch’s center. During the hours 6am to 6pm, the small circle is white. From 6pm until the morning at 6a, the small circle is black in color. Another touch of elegance from Glashutte Original is offering the watch with a eye-popping, Louisiana alligator leather strap. The watch strap is midnight blue. In addition, the strap has a white gold foldover clasp. Whether you are celebrating a special occasion and looking for that perfect luxury gift, or love owning luxury watches – the 2016 Glashutte Senator Chronometer would be the perfect choice. You’ll definitley make a fashio statement in VIP style with this awesome looking watch. The Life of Luxury has arrangements with most of the top luxury watch brands. If interested in the new Glashutte Senator Chronometer watch, please contact us today. Return again to follow our luxury blog. Read about the latest new and product releases in the luxury watch industry.